Handmade by our Master leather craftsmen, each leather desk blotter is meticulously crafted in a solid cedar wood frame and then hand bound in English Bridle or Mock Croc Leather. The pad is lined in Aspinal signature contrast super soft premium suede with a slightly soft padded surface for that extra luxurious touch. Both the left and right leather edges turn out to reveal a row of business card pockets to keep and file business cards from visitors until they are filed properly in an Aspinal Business Card Binder. 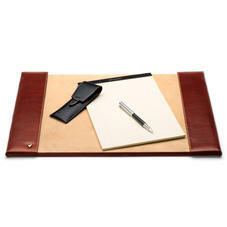 This is a classic piece that is practical to use and will look stunning on any desk.